ESA's Ariane 5 rocket was launched on 12 december 2017 at 18:36 UT from Kourou in French Guyana. It carried four Galileo satellites into orbit. 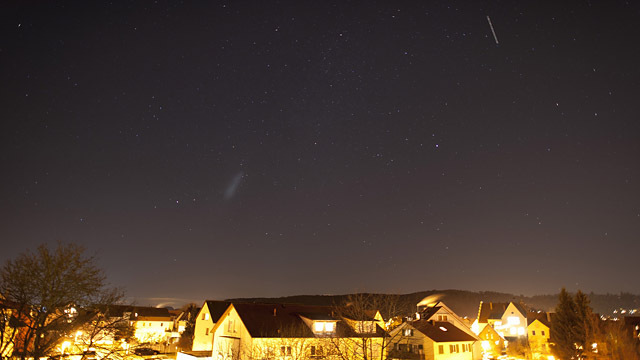 17 minutes after launch, a conspicious small and elongated cloud raced all over the sky of central Europe. Probably it is a fuel cloud of a separated rocket stage from the Ariane 5. The above time lapse was taken with 8 s exposures and 10 s interval total. A small dashed trail is visible in the cloud, the rotating rocket remnant. The observation and identification was confirmed by the netherlands SatTrackCam. See also the article in the german magazine Der Spiegel.